This entry was written by Sarah Jenkins, posted on 04/24/2015 at 11:59 pm, filed under April 2015 category. We began our day atop the Mount of Olives, overlooking the city of Jerusalem. This was the site of vast olive groves and gardens at the time of Jesus. Today this mountain has an active cemetery, perhaps one of the very largest in the world, as many thousands are buried here. Avi explained many of the customs of burial – no flowers, little window for a candle, etc then an overview of the Temple Mount. We quickly took pictures on this chilly, windy morning and headed back to the bus, but not before a couple of camel rides! Before we leave, we are reminded that we can see many aspects of ‘the Gospel’ from this vantage point – the Mount of Olives, His arrest in the Garden of Gethsemane, the House of Caiaphas for one of His trials, the Antonia Fortress where He was scourged and beaten. We have been to most of these already. 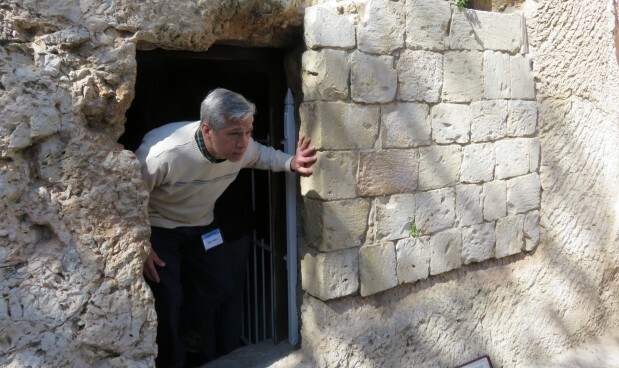 One important place, we cannot see – Golgotha and the Empty Tomb, which we saw before the end of the day. From the Mount of Olives we moved up the hill by the Old City pass the Dung Gate to what many believe is the site of the House of Caiaphas, the high priest. 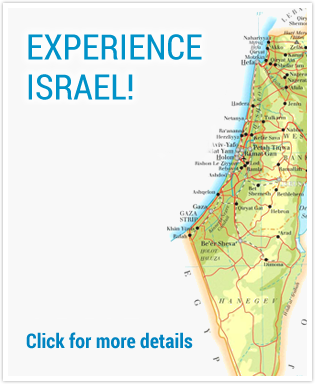 There is a great deal of archeological evidence to support this location as the place Jesus was brought before Jewish temple authorities. The steps that lead up from the Kidron Valley are the ancient stone steps that Jesus would have walked upon. The House of Caiaphas contained a jail where prisoners of “Jewish authority” could be detained, even punished. Jesus was before the Sanhedrin here and this was also where Peter denied Christ. We know from the gospel accounts that Jesus was beaten here. The house of Caiaphas is also where we find “the pit” – a simple and effective way of keeping prisoners. We were actually able to see the place where Jesus was beaten and we also were able to go down into the pit. Pastor helped us ‘see’ what happened here by having Bob Solomon read Psalm 88. This is a powerful place and will provide an entirely new perspective on the passion of Christ that unfolded during that fateful Passover. Mark Jenkins read from Zechariah 9: 11 about the waterless pit, then Pastor Becton read Isaiah 53. This helped us see one more sobering aspect of the suffering of our Savior. Avi showed us a detailed replica or model of the City of Jerusalem as it existed at the time of Jesus, which has become a cultural landmark. He pointed out key areas of the model city. This 1:50 scale model helps to put in perspective the many sites we’ve explored. One amazing site was seeing the four gates into the Temple – it’s all beginning to make more sense! We walked through the Shrine of the Book, which is home to the Dead Sea Scrolls and rare medieval manuscripts of the Hebrew Bible. The shape of the building resembles the cap to the jars that contained the scrolls. As we walked through the first hallway and into the circular portion of the building, we felt a sense of awe – portions of the Bible that were thousands of years old. Wow! Our next stop was at Kibbutz Ramat Rachel for a delicious lunch. This gave us opportunities at the tables to share our experiences. From the windows of the dining hall, we had a view of Bethlehem and shepherds fields. Our last stop of the day, but one the most moving was at the Garden Tomb. It’s just outside the Damascus Gate of the Old City – perhaps the most important acre of land in all of the world, as it touches both the place of the crucifixion and the resurrection of our Lord Jesus Christ. The British Evangelical Society now maintains this property and provided a guide for our visit. First we visited Golgotha, the place of the skull. We gazed at it over a fence as this famous hill is now in Muslim hands. There is a bus station on the grounds of what was most likely the site of the crucifixion. After a short presentation from our guide, we walked through a garden to see what many believe was the tomb of Joseph of Arimathea. As we each made our way into the tomb, we saw the sign “He is not here. He is risen.” Hallelujah! The tomb is empty! Here death itself was turned back. Here the promises of Jesus are powerfully underlined. Nothing, not even death itself, can separate us from the love of God expressed through Jesus. What a Savior! After our visit to the tomb, we stop to take communion to acknowledge the sacrifice that Jesus made for us as believers. Pastor Becton and Mark Jenkins led us in the observance of the Lord’s Supper, and we concluded our service with a song of commitment – ‘I Surrender All’. What a special time! Our journey through Jerusalem has been in the footsteps of Jesus. From the Mount of Olives to the house of Caiaphas, from to the Praetorium to Calvary – the end of this path is an empty tomb and the fulfillment of prophecy! God is true to His Word, and we are witness to it as we have traveled though the land of the Bible.